Walter Baker was born 5 March 1899, the fourth son of Charles and Charlotte (Chambers) Baker. His parents died in 1907 and 1908 leaving seven orphaned children: Percy Edward, Charles, Daisy, Walter, Charlotte, Jack, and Rose. They lived in The Dwellings, directly across from the Tilbury Docks. After their parents died, Walter, Charlie and Jack were taken to the Dr. Barnardo Homes orphanage. Walter and his brothers Charles and Jack were sent to Canada. They left in February 1909 on the S.S. Dominion owned by the Cunard Company. It took 14 days to cross the Atlantic. They docked at Portland, Maine, and went by train to Toronto, Canada. Walter was sent to a farm owned by Norman Swayze, in Winger, Ontario. His brother Charles was sent 8 miles away to a farm owned by Mr. Laidlaw. Walter attended a one room school house a mile away but was kept busy with farm work and attended school only until he was 14 years old. At age 16, Walter left the Swayzes to work six months for a farmer, earning $20 a month. His hours were from 7 a.m. to 6 p.m. seven days a week. He then worked for the John Deere Company in Welland, Ontario, in the wood shop for 60 cents an hour. Room and board was $10 a week. Walter’s brother Charlie enlisted in the Canadian Army and served in France. His brother Percy enlisted in the 13th Essex Regiment in England and was killed in France in 1917 and is buried in the Louverval Military Cemetery. 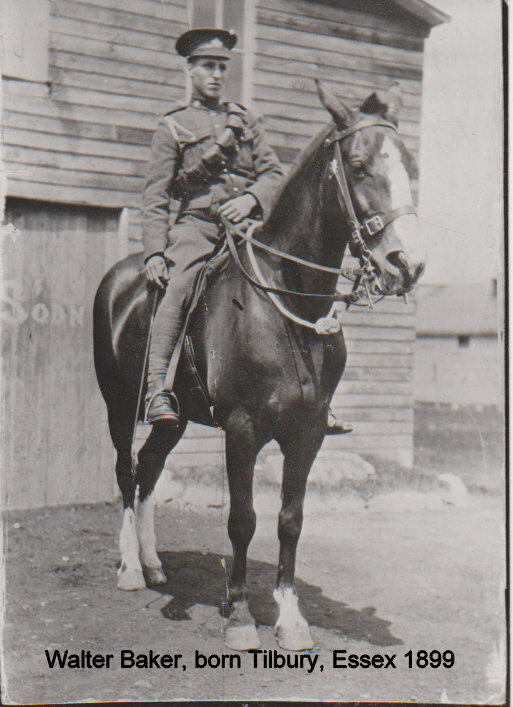 At age 18, on June 17, 1917, Walter enlisted in the Canadian Mounted Rifles #2729312. When sent to England, the calvary became the 102nd Infantry Battalion. He was stationed at Shorncliffe, at Rhyle, North Wales, and at Whitley Camp, Surrey. He had an opportunity to visit his sisters and Chambers grandparents while on leave in England. Walter was on duty in France from 6 March 1918 to October 3, 1918. He was involved in front line trenches in defensive actions from German attacks. On October 3rd, they were two miles from the outskirts of Cambrai “with the town plainly in sight”. Walter was setting up his gun when he was hit with some shrapnel in his arm. He was shipped to the Norfolk England War Hospital. The war ended November 11. Walter returned to work at the John Deere Company and then went to Saskatchewan to help with the summer wheat crop. He returned to Windsor and worked at the Ford Motor Company, Fisher Body, General Motors, and Chrysler, alternately, learning auto trimming. He worked under Walter Chrysler on the first six Chryslers that were built. Walter’s sisters Rose, and Daisy emigrated to Canada. Rose roomed with Dulcie Jay, whom Walter courted and married on 19 August 1925 in Picton, Ontario, Canada. Dulcie was born in England 17 August 1904, daughter of Daniel and Amanda (Chatfield) Jay. Walter and Dulcie had a son, Robert Jay, born in Windsor, Canada in 1927 and a daughter, Barbara Ann, born in Philadelphia in 1931. In 1981, Dulcie suffered a serious stroke and subsequently two more strokes. Walter had several illnesses and surgeries, including diverticulitis, hepatitis and sciatic nerve damage which required the use of crutches for several years, and finally a wheelchair. He managed to care for Dulcie in spite of these handicaps. She died 16 June 1986, aged 82. He remained cheerful, independent, an excellent chess player, and keenly interested in sports and world affairs. He died 25 May 1990, aged 91. My nan grace chambers was daughter of Eliza and Bertrum chambers wow I’ve been doing my family tree and found all the bakers on there always wondered what happened to the 3 little boys that went to Canada thankyou so much for sharing this information.